Point-to-Point racing is basically a form of steeplechase racing. Because it mostly involves amateurs it is something that even beginners can take part in. They started off as steeplechases in Ireland, where the local church spire was classed as the end point of the race, as it could be seen from a good distance. What is a Point-to-Point Race? Most Point-to-Point races follow a direct (straight) line, from one the starting point to the finishing line (hence the name). The British Horseracing Association oversees and regulates the sport and its race meetings, which are organised either by a Hunt (at the local level) or by a recognised Point-to-Point Club. The Point-to-Point racing season starts in December and runs through to June. In Ireland, Point-to-Point racing is a stepping stone to National Hunt racing, but in England and Wales, it's usually a way of winding down a successful National Hunting career. Most races happen at weekends, and last for more than three miles, in line with UK and Irish Point-to-Point regulations. Some races are longer than three miles, like the Lady Dudley Cup, which is three miles and two furlongs and the Heythrop Men's Open, which is four miles. The typical Point-to-Point race is two circuits of the course, but this isn't set in stone. Whatever the length of the race, each course needs to have a minimum number of fences for the horses to get over (around eighteen, but this varies), and two of these must have ditches. The fences are made from birch. Their typical height is four foot and six inches. Most of the horses involved are thoroughbreds, but this isn't always the case. They have to have a certificate from a Master of Foxhounds to confirm that they've taken part in the most recent hunting season for a minimum of four days before they go Point-to-Point racing. As well as this, you'll also need a certificate from the Hunt Secretary. If a horse has been deemed eligible for entering Point-to-Point races, it is also eligible for entering hunter chases. Many jockeys' first experience of horse racing came from Point-to-Point racing, and it's a good way for aspiring jockeys to learn the basics or racing. 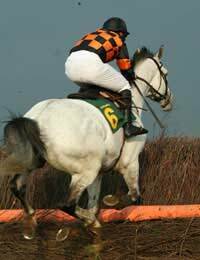 Point-to-Point racing is also a proven starting point for horses, many of whom have made the leap from Point-to-Point to National Hunt racing with lots of success. Point-to-Point racing is a form of amateur steeplechasing that requires the horse and rider to negotiate fences along the way and has been a strong platform for aspiring jockeys who want to make the move up to National Hunt racing. There have been many success stories from both horses and riders, and the sport is now regarded as one of the best ways to launch a Point-to-Point career, especially in Ireland. However, it's worth noting that things are slightly different in England and Wales, and many riders who have had success at the National Hunt level with step back down to Point-to-Point racing as a way of ending their racing careers.